You expected a different outcome from “Justified”? Will we ever know the truth as to what happened? 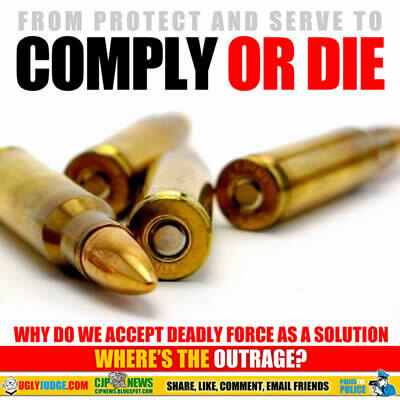 Fact is government such as police, FBI or judges are rarely to never held responsible for their actions. Walter Scott’s murder was caught on video as Officer Michael Slager shot him in the back executing him, then placing his taser by the body. It’s events like this where the government official should face a long prison sentence however not to anyone’s surprise he’s rewarded and set free. Millions of people are victimized each year by a broken system where government uses your tax dollars to victimize and terrorize you. When they commit crimes, murder or abuse it’s business as usual but if you do the same it’s prison or death. Why do we always want to trust an image, words likes “rights, freedom, constitution and equality”? Especially when there are an obvious two classes, those forced to obey (the public) and those who hide behind law who are “above the law”(government). Since the shooting, which was captured on video from the FBI’s birdseye view, there have been many theories surrounding the death of La Voy Finicum. According to the official story, Lavoy Finicum was killed by officers because they had no other choice as he was reaching for a gun in his left pocket. Officials claim they later found a loaded 9 mm semi-automatic handgun in that pocket. 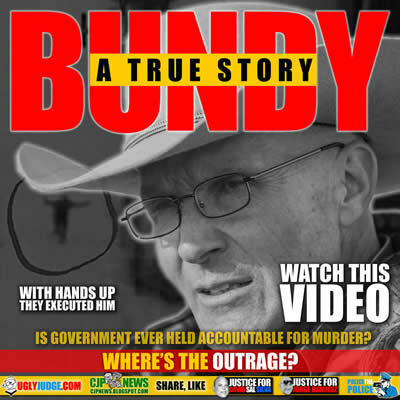 It is evident from the video that Lavoy Finicum never presented the handgun. However, we can clearly see him reaching for his left side. In a photo of the autopsy report, taken by RT’s Simone Del Rosario at the press conference on Tuesday, and the newly released video, there is a now an alternative reason, outside of going for a gun, as to why Lavoy Finicum was reaching toward his left side — he was shot there. The newly released video shows that officers and agents opened fire on the vehicle prior to Lavoy Finicum exiting it. Is this the Freedom, Rights, Equality and Constitution you pay taxes for?